Air blue is the leading airline company in Pakistan and they are providing equal opportunities for all the people of Pakistan. This year, air blue is hunting the talented people all across Pakistan for the varied job fields. They have declared 50+ Air Blue Pakistan Jobs in varied fields to target the young talent of Pakistan. You can apply for this job online, by sitting at home. They require skillful, safety minded and innovative person for their job. Moreover, both male and female are encouraged to apply for this great opportunity. The Air Blue Pakistan Jobs are provided in the following major fields which have many other categories. Travel Counselor Job in Karachi, Islamabad, Lahore, Multan, and Peshawar centers. There are more than 12 vacancies for this for females. For Engineering Assistant Technical Records, they require only one person in the Lahore airport. For ground services, they require two performance executives in Lahore and Multan airports. They require two medical officers in Islamabad and Lahore airport. For Islamabad corporate headquarter, Air Blue requires 1 eligible person for this job. The person should be physically fit and must have driving experience. If you want to apply for more than one category, then you have to apply through the given procedure. 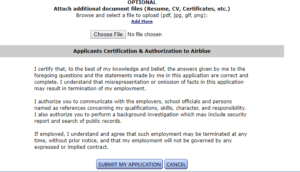 First of all, go to the official site of the Air Blue (https://www.airblue.com/jobs/) and click on the Job Tab. Now, a form with various sections is displayed which should be fully filled with proper care. In the first section, you have to provide proper personal information such as name, address, phone number etc. In the second section, you have to provide all the academic information, any training, and skills that you have. Now, in the third section, you have to provide all the experience information that you have. Next, if you are trying with some channel, then provide the appropriate references. Moreover, you have to upload your latest passport size picture. Finally, read all the terms and submit the application. After that, they will call the shortlisted candidates for interview.